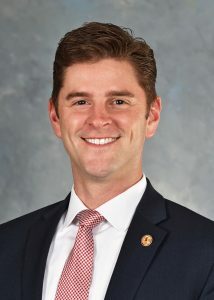 Ryan Spain has served as State Representative of the 73rd District since January 2017, following the retirement of State Representative David Leitch. A lifelong Peorian, Spain attended District 150 schools and is a Richwoods High School alumnus. He graduated from the University of Illinois at Urbana-Champaign with a double degree in political science and speech communication and Bronze Tablet Honors. Spain also holds an MBA from Bradley University. In April 2007, Spain was elected to the City Council as the youngest at-large member in Peoria history, a seat he held until Fall of 2016. He is currently employed at OSF Healthcare System as the Vice President of Economic Development. Spain and his wife Ashley have a five-year old daughter named Vivienne and a one-year old daughter named Eleanor. Since serving in the Illinois House, Spain sponsored landmark legislation allowing volunteer work at Illinois State Parks and Trails as well as working closely on issues related to mental health, hospital and healthcare transformation. On a more local level, Spain has always enjoyed spearheading initiatives to bring jobs and economic growth to our region. He was proud to serve as the driving force in Peoria’s Warehouse District, which has become a mixed-use district that is bringing both businesses and residents back to the core of the City. In his professional life, as a healthcare manager, he has seen firsthand how government decisions are affecting the private sector and how lessons learned by the private sector can be applied to challenges in government. We all agree our State needs to take a new direction and Ryan Spain welcomes the opportunity to build a better Illinois. Representative Spain has received high marks for his voting record from the Illinois Farm Bureau, Tooling & Manufacturing Association, and Illinois Health Care Association. He was recently named a Friend of Agriculture by the Illinois Farm Bureau and was awarded the 2018 Leadership Award for Improving Telehealth Policy from the Illinois Telehealth Initiative. Spain’s service to his community has not gone without recognition as he was honored as an inductee into 40 Leader Under Forty by InterBusiness Issues Magazine in 2007, was nominated and served as an Edgar Fellow in 2014, was Co-Chair of the 2013 All-America City effort by Peoria, is a Co-Founder and Board member of Peoria Downtown Development Corporation served as Chairman of the Peoria City/County Shared Services Committee and served on the Boys & Girls Club of Greater Peoria’s Advisory Board.